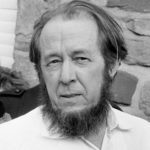 Aleksandr Isayevich Solzhenitsyn was a Russian novelist, historian, and short story writer. He was an outspoken critic of the Soviet Union and communism and helped to raise global awareness of its Gulag forced labor camp system. He was allowed to publish only one work in the Soviet Union, One Day in the Life of Ivan Denisovich (1962), in the periodical Novy Mir. After this he had to publish in the West, most notably Cancer Ward (1968), August 1914 (1971), and The Gulag Archipelago (1973). Solzhenitsyn was awarded the 1970 Nobel Prize in Literature “for the ethical force with which he has pursued the indispensable traditions of Russian literature”. "For a country to have a great writer is like having a second government. That is why no regime has ever loved great writers, only minor ones." "You only have power over people so long as you don’t take everything away from them. But when you’ve robbed a man of everything, he’s no longer in your power – he’s free again." "Our government declared that it is conducting some kind of great reforms. In reality, no real reforms were begun and no one at any point has declared a coherent programme." "I can say without affectation that I belong to the Russian convict world no less than I do to Russian literature. I got my education there, and it will last forever." "Of course God is endlessly multi-dimensional so every religion that exists on earth represents some face, some side of God." "Own only what you can always carry with you: know languages, know countries, know people. Let your memory be your travel bag." "The battleline between good and evil runs through the heart of every man." "The next war… may well bury Western civilization forever." "I have spent all my life under a Communist regime, and I will tell you that a society without any objective legal scale is a terrible one indeed. But a society with no other scale but the legal one is not quite worthy of man either."